Only Encausticbord has a ready to use surface formulated for the unique demands of encaustic painting and mixed media. Encaustic gesso is applied to Ampersand’s sealed Hardbord™ panel to form a bright, smooth and velvety surface that is ready to use with the ancient technique of encaustic painting. The ground is not only heat resistant and highly absorbent, but also holds tight to layers of wax and collage without the fear of cracking or separation. Encausticbord is available in 3 profiles: 1/8”, 7/8” cradle, and 1.5” cradle. Works well with collage, oil sticks, image transfer, water based paints, pigmented ink and both coloured and graphite pencils. Also works perfectly with PanPastels. 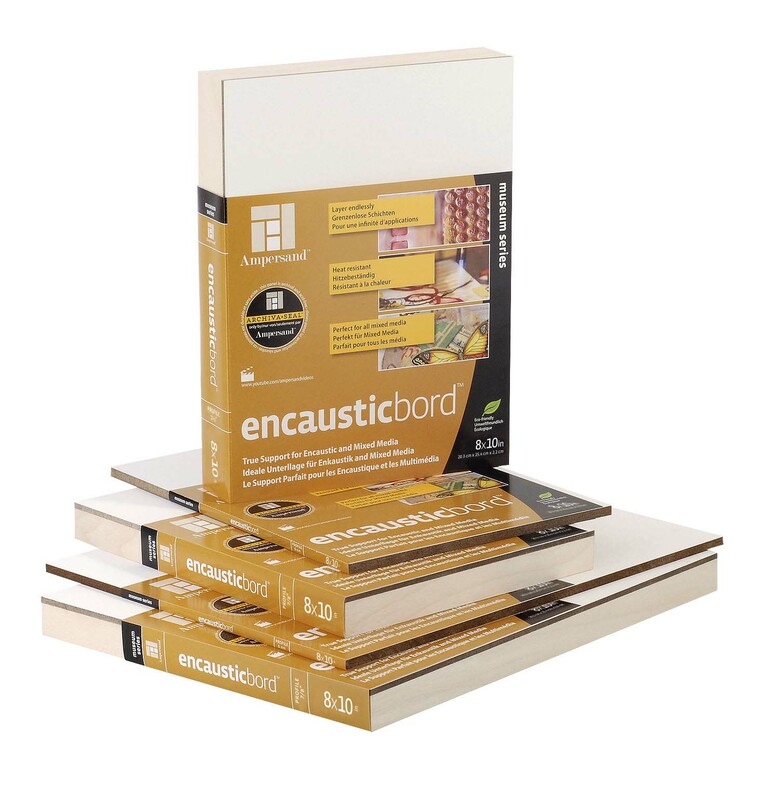 £9.67 Encausticbord 11x14 - 1/8"
Encausticbord is not only great for Encaustic painting but will give fabulous results with PanPastels and a variety of Pencil Media. This product measures 11x14 - 1/8"
£2.79 Encausticbord 5x7 - 1/8"
Encausticbord is not only great for Encaustic painting but will give fabulous results with PanPastels and a variety of Pencil Media. This product measures 5x7 - 1/8"
£6.08 Encausticbord 8x10 - 1/8"
Encausticbord is not only great for Encaustic painting but will give fabulous results with PanPastels and a variety of Pencil Media. This product measures 8x10 - 1/8"
£4.79 Encausticbord 8x8 - 1/8"
Encausticbord is not only great for Encaustic painting but will give fabulous results with PanPastels and a variety of Pencil Media. This product measures 8x8 - 1/8"